To learn how dogs process language, Andics and his team needed to see into their brains. 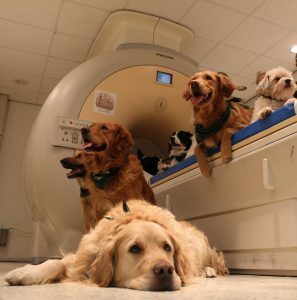 The researchers trained dogs to lie still in a functional magnetic resonance imaging machine (fMRI) for seven minutes. Now, for anyone who hasn’t had an MRI, you cannot move a muscle as a sound akin to a jackhammer echoes in your ears. Imagine getting a dog to not move through that. It took his team months to train six border collies, five golden retrievers, a German shepherd and a Chinese crested to remain still as their brains were scanned. 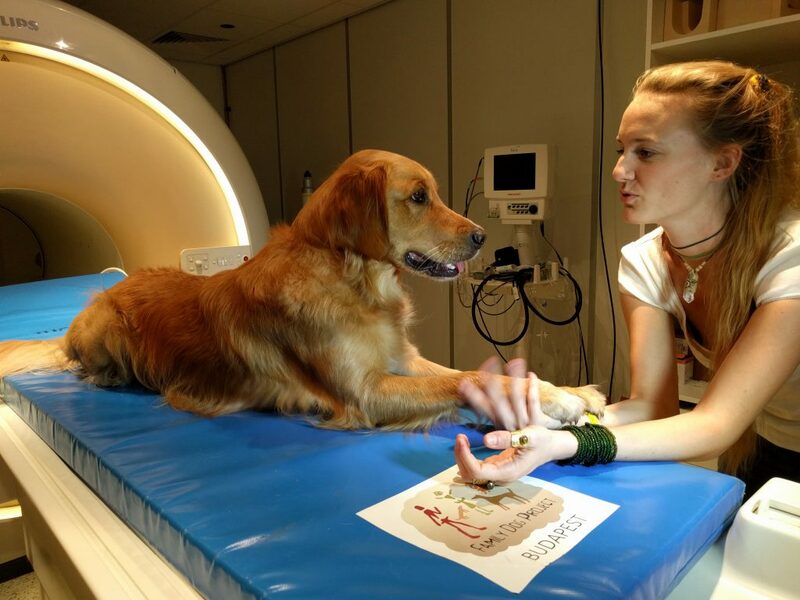 While lying in the fMRI, the dogs received four different vocal cues from their human trainers: a neutral word like “yet” in a monotone voice, a praise like “well done” in an excited voice, a neutral word in an excited voice and a praise word in a monotone voice. The scans showed that dogs brains process language much like humans. A dog uses the left hemisphere of its brain to interpret words, whether it’s praise or not, and the right hemisphere to interpret intonation, whether the voice is excited or not. Andics and his team also discovered that dogs only recognized a praise word as actual praise when the intonation matched, which they gauged by examining a pleasure center in the brain that lights up in response to food and petting. When the dogs in the study were told “well done” in an excited voice, this pleasure center lit up. However, it remained dark when a praise word was said in a monotone voice, or a neutral word was said in an excited voice. Julia Fischer, head of the German Primate Center — a research lab with the University of Göttingen dedicated to non-human primate cognition and communication — told NewsHour that while this study will hopefully inspire further research into language, there are still plenty of question marks. “I imagine that the trainer said something like ‘Good boy, well done,’ but I do not assume that the dog would be thinking about a boy, or what the word ‘good’ means,” Fischer said. In other words, the dog may not know what the phrase “good boy” means, just that the collection of sounds signal praise or a reward. She said the study could also benefit from more testing to rule out false results. For example, if the dogs’ owners used “good boy” in an excited tone as praise during training, the dogs could learn that “good boy” is a positive phrase and could mean a reward, like a dog treat. Then when they hear “good boy” in an excited tone during the experiment, the dogs would expect it to be praise and the pleasure center of their brain would light up in anticipation. These findings go beyond human’s best friend, Andics said. They potentially give a glimpse at how language developed in humans over time.